Refurbished Solo-Baric L7 Subwoofer technology continues to maintain the title as the first and foremost authority on bass. It was the world? ?Ńs first patented square subwoofer, supplying the extra decibels needed for deep, musical bass in a mobile audio system. "Bass is what we are all about? ?í it? ?Ńs our specialty," Kicker founder and President Steve Irby said. "From the very start, we? ?Ńve been known for rich sound ?? it? ?Ńs the Kicker heritage, and it? ?Ńs carried out through all we do." The Refurbished Solo-Baric? ?Ńs cutting-edge, square-sub design ultimately means more cone area, more air displacement and, therefore, more decibels than a conventional round woofer. With a patented corner-ribbed, double-stitched Santoprene??? surround helping to hold the massive motor structure in place, the Refurbished Solo-Baric L7 provides durability at a high excursion without compromising sound quality. "We? ?Ńve got the accuracy, but we also have the intensity,?? Irby said. ? ?When we listen (during testing), we listen to it loud ?? we know there is no distortion. We make sure of it." The Refurbished Solo-Baric L7's highly-engineered motor structure handles huge power and provides extreme output. With heavy-duty, ribbon tinsel leads intertwined with semi-progressive spider technology, the square sub promises dependability when pushed to the limit, while dual voice coils with high-temp copper windings easily handle intense heat and power levels. In addition to the unshakable structure, the Refurbished Solo-Baric revolves around Kicker? ?Ńs most advanced cone design, the injection-molded SoloKon?? ?, which adds targeted strength for reliable performance and accurate response. The 360-degree, constant-contact back bracing adheres directly to every contour of the SoloKon square cone, maximizing the mechanical coupling of the motor while making the woofer as strong and responsive as possible. Venting in SoloKon? ?Ńs back-bracing and along the perimeter of the spider landing provides maximum air-flow to cool the voice coils during operation. 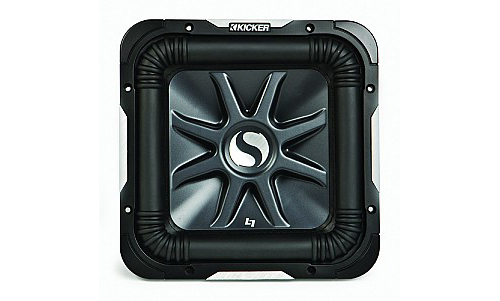 The woofer utilizes a high-mass, extended pole piece to aid in heat dissipation. The distinctive cast-aluminum basket provides a strong motor foundation, maintaining a low temperature and a mild magnetic field for the most efficient motion, as well as protecting the Refurbished Solo-Baric? ?Ńs specialized inner workings. The Refurbished Solo-Baric L7 woofer remains available in 2-Ohm or 4-Ohm DVC and conducts business from a sealed- or vented-box application.